[ARCHIVED THREAD] - WHAT KIND OF GUY RUNS LARUE TACTICAL? I HAVE ONE SPECIFIC ORDER FOR 15X CUSTOM UPPERS THAT REQUIRE LARUE 7.0 FORENDS. I MADE THIS KNOWN TO THE FOLKS AT LARUE TACTICAL. THEIR ENTIRE OPERATION HAS FOR SOME TIME BEEN DEDICATED TO FILLING SOME LARGE ORDERS FOR THE H.S.L.D. CROWD. BUT, THEY'VE BEEN TRYING TO ACCOMODATE ME. EARLY THIS PAST SATURDAY EVENING, I GET A CALL FROM MARK LARUE, THE HEAD HONCHO. MARK WORKS I THINK 24/7. MARK HAS SOME FORENDS HE'D ASSEMBLED ON HIS OWN! BUT, HE'D CALLED TO APOLOGIZE FOR MISSING THE SATURDAY FEDEX DROP OFF TIME. HE WANTED TO KNOW HOW FAR I WAS FROM THE LOCAL GREYHOUND STATION. HE WAS WILLING TO DRIVE DOWNTOWN ON A SATURDAY NIGHT TO PUT THEM ON A BUS. I THINK I AM GOING TO GO CRACK A PYRAMID PALE ALE (6.7%) WITH MY LARUE TACTICAL ARMADILLO AND DRINK IT IN MARK'S HONOR. EDIT: I wrote banghead, instead of headbang. My bad. +1 for Larue, products and people. Turn all of your hunting and fishing expenses into a deduction. MSTN, Turn the caps off dude. I recently got a Larue Aimpoint mount from you and it is one solid piece. Always nice to hear good things instead of the typical complaints people usually have. Sounds like a good guy. The guys at LaRue are first rate. I ended up buying direct from them and they threw in some of those cool bottle openers because it took 'em 4 days to ship because of all of their orders. Hell, I'd wait another 3 months for one of their products, the foreend and mount are flawless. The Dec issue of SWAT has more about him. I'm trying to get all the Larue gear I need before it hits the newstands and he gets backordered forever. If Wes turned off his caps lock we'd start thinking some imposter took over MSTN. I used to have a boss that NEVER used caps. For some people, these things are indeed trademarks. Your Puny Weapons Cannot Stop the Pinata of Death! Wes isn't shouting, he has perfect diction. Thanks for posting that, Wes. We quickly hear from "a friend of a friend" how Company X did them wrong but excellent customer service all-too-often passes without comment. My next rifle will be a DIY project and there's no doubt LaRue parts will play a big part in it after reading about their excellent products and their devotion to their customers. The meek shall inherit the Earth. The cripples shall get all the good parking spaces. Thanks for posting that, Wes. We quickly hear from "a friend of a friend" how Company X did them wrong but excellent customer service all-too-often passes without comment. My next rifle will be a DIY project and there's no doubt LMT parts will play a big part in it after reading about their excellent products and their devotion to their customers. He posted about LaRue, not LMT . And here I thought Wes was gonna dig into someone in a bad way. Sounds like LARUE TACTICAL is good people. And I think this post seals the deal... I'm going Larue over DD... and I'm ordering from Wes. Ugh, I should have enough cash put aside by Early December. It's late and I'm heavily medicated, Adam. Thanks for the subtle nudge. I have one Larue BUIS inbound! Mark is a good for sure and goes out of his way to help me out! When the 5.56 just isn't enough; get an AR10! The world's a cold place; better pack your own heat. Onetime it took Mark two hours to answer my email late in the day on a Saturday. Its a little early to start drinking don't you think, Wes? 16" Midlength, 1:7 twist group buy! It's a GO now!!! They are great people to deal with. LaRue Tactical is donating product for prizes at our 3 Gun Match in Texas in November and I know they sponsor a lot of other matches too, Good folks that support the shooting sports! He has written permission to use CAPS. 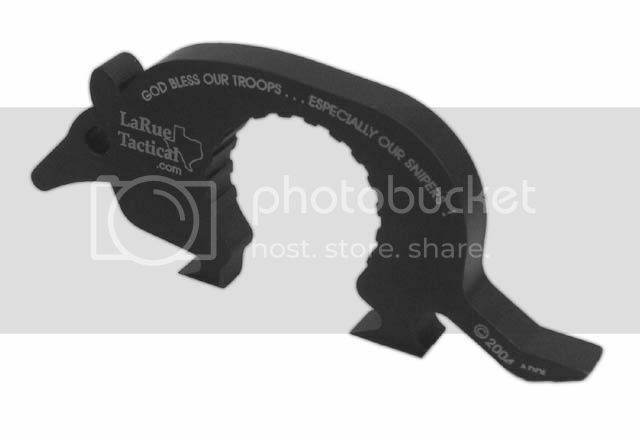 I ordered an Eotech mount directly from LaRue about 3 weeks ago. I was surprised that it was actually Mark that answered to phone. He was genuinly interested in where I heard of LaRue Tactical and why I decided to buy from him. Kind of cool in my book. +1 for Mark. He did something incredibly cool for me, and is a genuine nice guy. Wes, I am not at all surprised to hear your story. I WAS TRAVELING THROUGH THE TEXAS HILL COUNTRY TO A GOOD FRIEND'S WEDDING THIS WEEKEND. SINCE I WAS IN THE NEIGHBORHOOD (WITHIN 100 MILES IN TEXAS IS "IN THE NEIGHBORHOOD"), I STOPPED BY LARUE TACTICAL WHERE I HAD THE CHANCE TO MEET MARK, MIKE, AND MARK'S WHOLE FAMILY IN PERSON. OF COURSE, I HAD MY LITTLE TRIBE IN TOW. MY THREE BOYS, 11, 15, AND 17, GOT AN EYEFUL OF A DESIGN AND MANUFACTURING PROCESS MOST NEVER HAVE THE PRIVILEGE TO WITNESS. FORTUNATELY, THEY CAME EQUIPPED WITH SOME APPRECIATION FOR THE END PRODUCTS THAT RESULT. IT'S BEEN A LONG TIME SINCE I HAVE BEEN EXPOSED TO SUCH. LOTS HAS CHANGED! YES, I HAD MY EYES WIDE OPEN THE ENTIRE TIME! THERE'S AS MUCH ART IN THE DESIGN OF THESE PRODUCTS AS THERE IS ENGINEERING, TO MY EYE. WAIT UNTIL THE NEW LARUE TACTICAL FIXED BLADE KNIFE IN S30V HITS THE STREET! THE NEW SUREFIRE MOUNT? SAW IT, RAN IT. THE NEW DR OPTIK MOUNT? SAW IT, RAN IT. SAW SOME OTHER STUFF, TOO, THAT I SHOULD NOT MENTION, JUST YET. LARUE SHOULD KEEP SOME SORT OF CHRONOLOGY OF ALL OF THESE WEAPON RELATED COMPONENTS. SOMEDAY, THEY'LL BE GLAD THEY DID. WE LEFT EQUIPPED WITH ENOUGH TACTICAL 'DILLOS TO ENTERTAIN THE ENTIRE WEDDING PARTY, PLUS A COUPLE OF EXTRAS MY 11 YEAR OLD PEDDLED TO THE STAFF AT MCCORMICK & SCHMICK'S RESTAURANT IN AUSTIN. THANKS FOR THE HOSPITALITY, MARK! ....and I still can't get an ACOG mount. THE NEW LARUE TACTICAL FIXED BLADE KNIFE IN S30V HITS THE STREET! Its always about you isn't it SHIVAN!